In a mixing bowl mix together the crumbs and butter; press onto the bottom and up the sides of a 9-inch pie plate. In your electric mixer’s bowl beat together the cream cheese, sugar, and peanut butter. Mix well.Toast the pecans over medium heat for 3 minutes on your stovetop – shake them frequently so they don’t burn. Add the whipped topping and half of the toasted pecans to the cream cheese mixture; blend well. 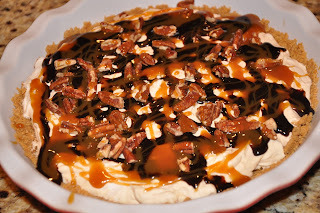 On the bottom of the cookie crust spread 1/4 cup of caramel ice cream topping Add the whipped topping and half of the toasted pecans to the cream cheese mixture; blend well. On the bottom of the cookie crust spread 1/4 cup of caramel ice cream topping Spread the cream cheese mixture on top of the caramel. Freeze for 3 hours. Take out the pie and spread the rest of the pecans over the top. Melt some chocolate and drizzle it with a spoon across the entire pie. When done with the chocolate, get the caramel topping and drizzle some more. Put it back in the freezer for another 1 to 2 hours. Dig in! Keep it frozen. OH my word....this looks AMAZING!!!! Uh, yum. Praying I can find caramel icing topping here!!!!!! This looks amazing, I would love to have a slice of this right now! Yum!! I'm so glad you linked this!